‘Stations in the past have done a huge disservice to their towns and cities. 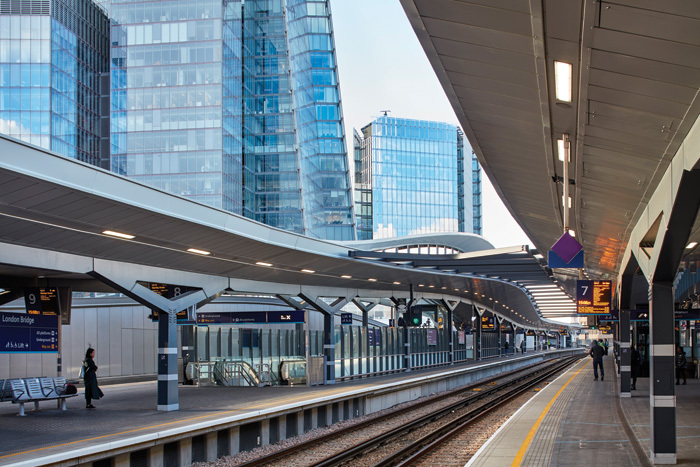 That dialogue between the city and station is being renegotiated.’ These words, from Grimshaw partner Mark Middleton, were uttered five years ago in a conversation we were having about the ideal 21st-century rail hub. 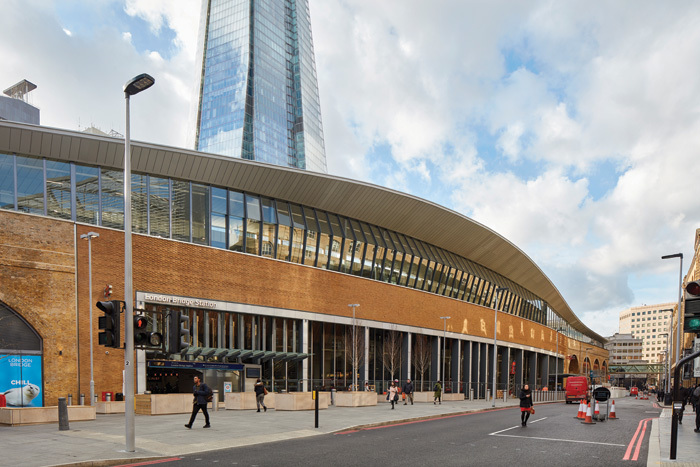 And that promise is being delivered, big time, as the practice’s £1bn London Bridge Station refit is revealed this spring, one of the most complex and ambitious rail-station developments in the UK to date. Where once there was a confusion of exits and entrances, almost hidden from the main street, and the station’s workings were obscured by escalators, filthy bridges, pigeon-strewn canopies and dark, Victorian tunnels, London Bridge Station is now all light and clarity. There is a civic and expansive quality to this previously most pinched and contorted piece of infrastructure. But one of the most impressive aspects is how it knits together two London neighbourhoods — Bankside and Bermondsey — which had spent 150 years completely isolated from each other, thanks to the huge Victorian viaduct that supports the raised tracks. The dreary museums, poky shops and boarded up archways that clogged the eastern viaduct have been cleared away and replaced with a vast, 9,000 sq m concourse. 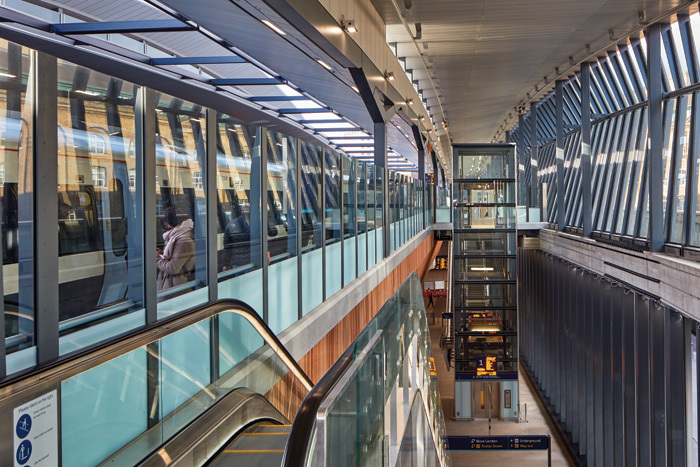 Glazing along the concourse exterior on both sides reveals the ever-shifting passenger pathways, providing street-level animation and easy sightlines, and access between these two pieces of city. This isn’t so much refurbishment as reincarnation. Instead of routing passengers through the aforementioned tunnels and staircases — or up the ramps to the rear of the railway viaducts to track and platform level — the street level now becomes the station’s ground floor, with ample room for congregating, ticket sales, shopping and eating before riding up wide escalators and staircases to the platforms on the upper level. 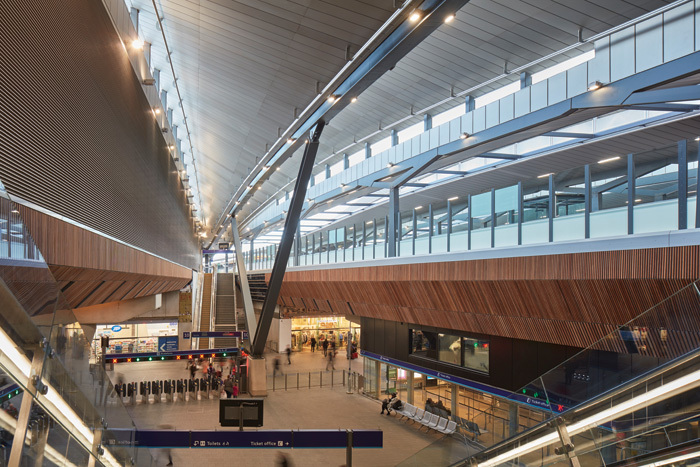 Great slabs of north light flood into the concourse from the apertures between platforms, with additional layers of south light filtered through the glazed strip beneath their undulating metal canopies. These multiple percolations of top lighting generate an impression of the triple-height concourse as forest clearing: the contoured cedar-clad bridges are like branches reaching up to the sky, while the fat, sculpted columns of concrete which support them are the trunks. This concourse has a robust but craftsman-like, Continental feel, the timber roof reminiscent of another favourite contemporary station — Rotterdam Centraal, a collaboration between Meyer & Van Schooten Architects and West 8, which opened in 2014. 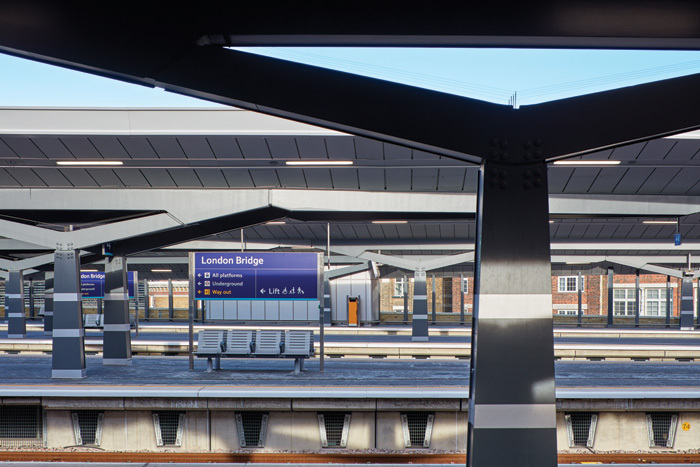 ‘We had to fight to get the timber because of perceived fire risks, but we wanted this human, very simple, haptic quality,’ says Middleton as we tour the new station on a February morning. ‘It has a feel of a quality space,’ he continues, even ‘ecclesiastical’. Unlike many generic transport hub schemes constructed in London and all around Europe today, he says, ‘this is not a non-place. I think this is a place. And because you have got the rhythm of the timber, it does this little trick of pulling the perspective shorter to minimise the length of the concourse.’ Acoustics are also improved by the timber cladding, and sound-dampening material behind them, so that Tannoy announcements in this cavernous space can remain intelligible — a vital detail, in stations of this scale. And you can already see how well this concourse works to contain and control the ebb and flow of passengers. As if sheltering in a glade, there are always people perched on the seating around many of the column’s bases, taking advantage of the multiple screens on which the trains and platforms are advertised, while munching on their takeaways from Leon or Pret. You can sit or stand almost anywhere and be within view of these screens and then see at a glance where the trains are. The swooping diagonals of the escalators, dramatic V-shaped trusses and rippling canopy contours reinforce that sense of movement and purpose. From the street, the new station is very much embedded into the cityscape. This is not a Calatrava-esque statement building, visible for miles around (not that Middleton would mind — in a previous conversation, he described Calatrava’s convulsing skeletal structures as ‘very nice, for a paperweight’). It is a station that balances poetics with pragmatics. It offers its best profile from Tooley Street. From here, the scale and solidity of the station grounds and balances the crazy verticalities of The Shard, which was already nearing completion when the station construction started. 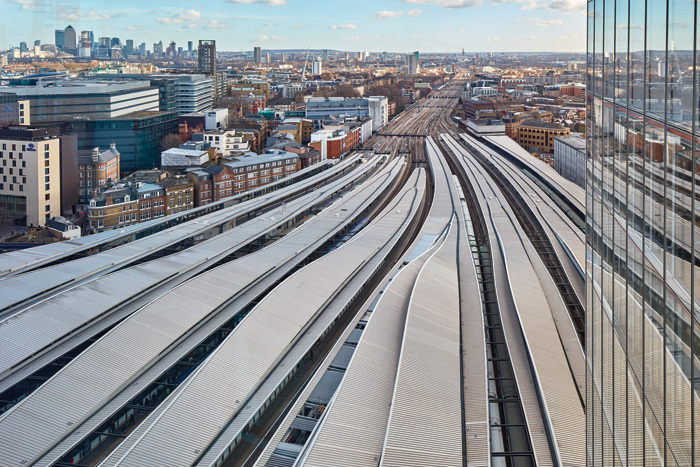 Although Grimshaw’s design wasn’t specifically referencing this lofty neighbour, Middleton says: ‘There is a nice synergy: the station is as long as The Shard is tall. There is a dialogue between the two. But [despite the protestations of previous mayor Boris Johnson] our roof is not a big blob on top of the station… The station is basically this solid plinth with ribbons of light on top of it.’ Unfortunately, the full effect of the canopies’ snaking choreography can only be fully appreciated from above — ideally, from one of The Shard’s bars or facilities. If there is a somewhat clunky, Meccano-esque quality to the platform architecture, it is probably because it is constructed from modular units, entirely created off site. This was one of the real innovations of this project — crucial in keeping to the schedules while remaining operational. ‘Obviously time is money on this kind of job,’ explains Middleton, ‘so we had 6ft modules, which contained all the conduits, all the light fittings. And all the decks on top and the interior and the roof soffit were modularised, and they were all loaded on to pallets and delivered here. Then all we had to do was zip it up. All the platforms were built that way. Once here, they had to pull the cables through, but all the trays, all the fittings — smoke detection cameras, everything — was done in the factory, so they knew it was installed properly Deconstructing and then building at speed, all while operational, required close co-operation and collaboration between the construction and engineering teams throughout. It’s the first time a rail operator had worked in that way. Says Middleton: ‘It came through discussions with the contractor. A lot of architects would be reluctant, but we were happy to do it, because they basically started demolishing the building from our planning drawings, so we thought we have to get on site and get this done as quickly as possible. At one point we had about 40 people down here.’ This collaborative approach also grew out of the partnering agreement between client Network Rail and the contractor, Costain. 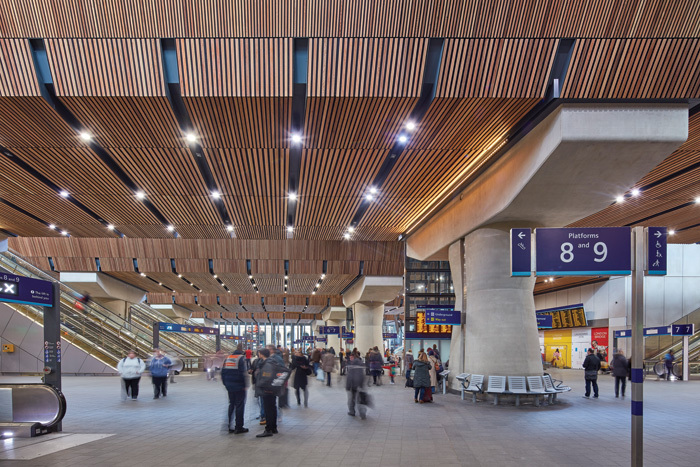 Costain formed a joint venture with structural engineer Arcadis and WSP, which employed Grimshaw, effectively putting it bottom of the pecking order, but in charge of the design. ‘Designing with construction in mind means you can get a really good outcome,’ says Middleton. 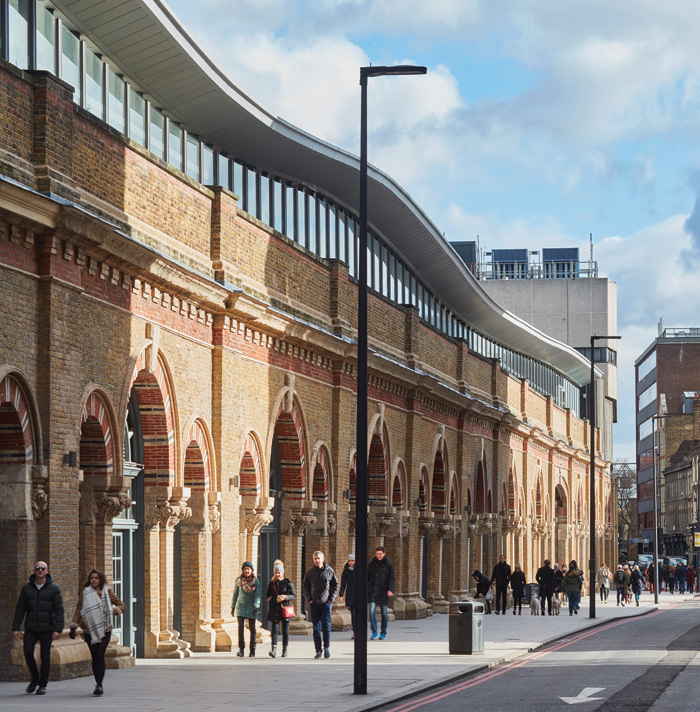 If the platform architecture smacks more of pragmatics, there is poetry elsewhere: in the quality of materials, the scale and contours of the main concourse, and along the exterior, where original Victorian and Edwardian arches have been retained and restored. There’s a pleasing detail where the contoured glazing, running along the top of the station under the canopies, bulges out; a bulge signifies a station entrance. Although very little of the original station has been retained, Middleton talks about weaving elements of memory through the scheme, linking the old with the new through a material palette of brick, stone and glazing to echo the surrounding streetscapes of Victorian Bermondsey brick shopfronts, and More London’s gleaming 21st-century office blocks. 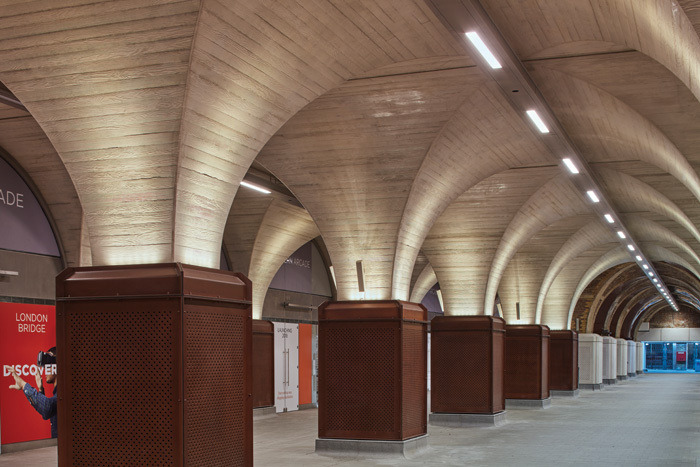 There are some nice additional touches: for example, in the wide tunnel that links the main concourse with the Underground entrance (taking up part of what used to be Stainer Street), an army of thick, concrete pillars arches up to the ceiling, to mimic the older brick ones of the previous Underground connection tunnel halfway, matching them in scale and form. The bases of the new, concrete pillars have been encased in perforated corten-steel panels, while the older brick pillars are cased in perforated concrete ones. ‘It’s a positive and negative,’ says Middleton. ‘This is a bit about memory — saying, actually we like the vaulted ceilings, we like the shape of it. These are structural. We wanted to do something that evokes the Victorian station. It’s dialogue between the two, to say that this is the new bit and this is the old bit; like a tidemark.’ There is also a viscerally thrilling moment, from just beyond and to the left of The Shard entrance, where platforms 9 and 10 intersect in a vertiginous vista of swooping lines, gleaming light and twisting steel. But Middleton isn’t a man for fancy talk (never mind frilly architecture). ‘The project is all about capacity,’ he says. 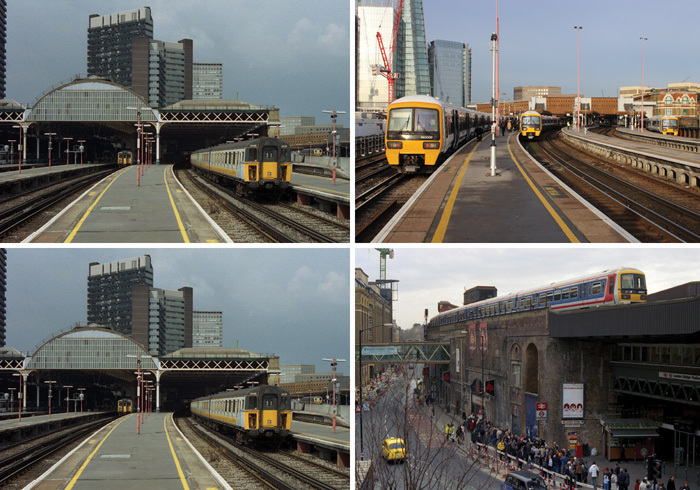 ‘London Bridge unlocks 80% of the capacity of Thameslink [the train operator]. I think you get 22 trains an hour through a terminating platform and 66 through a through platform. Effectively we have added three more through tracks. But also all the signalling is better, that’s why the throughput is faster. A new platform was added and the orientation of the station was reversed: there used to be six tracks that transited through the station and nine terminating, and that has been switched to nine through and six terminating. The station is designed to cope with 96 million passengers a year now; before, it was 54 million.